Nothing kindles the holiday spirit like festive shop windows, outdoor ice skating rinks and glowing, twinkling lights in the evening. Discover three area events that are sure to brighten your season. 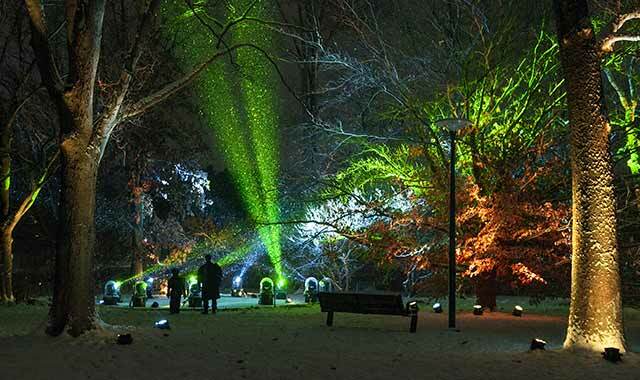 Morton Arboretum’s Illumination event sets trees aglow with many colors, fanciful light shows and interactive displays that respond to sound and touch. Something magical happens this time of year, as the days grow shorter and the weather grows colder. We illuminate the dark days with brilliant lights, and we spend more time with family. It’s a perfect time to enjoy colorfully decorated Christmas trees, sip hot chocolate, indulge in seasonal treats and look for ways to give back to others. As our region kicks off another festive holiday season, here are a few special events that promise to brighten your December. Deirdre White has been actively involved with the Downtown Elgin Association for many years, first as a volunteer, then as a board member and finally executive director for the past year. Hosting holiday events in downtown Elgin is her favorite activity this time of year. For the past six years, Home for the Holidays has been an annual event that unites Elgin-area nonprofit organizations in the spirit of collaboration. Activities throughout November and December include food and toy drives, holiday concerts, art showings and more. This year, 20 nonprofits are taking part in various activities. The annual kickoff took place in early November at the Gail Borden Public Library, with a festival of trees, kids’ crafts, photos with Santa and even horse-drawn carriage rides. Start your holiday shopping off with a bang during Small Business Saturday, on Nov. 29. This is the locally owned merchant’s version of Black Friday and Cyber Monday, and in Elgin, between 30 and 40 small businesses, ranging from boutiques to restaurants, will take part. The best part, White adds, is that customers can walk into the shops and speak directly to the business owners. “They’re the ones who know their products,” she says. Window Wonderland also features an appearance by Santa Claus, an open house hosted by the Elgin Police Department, plenty of hot chocolate and roasted chestnuts, holiday music and an appearance by Santa’s reindeer. City Skate, an outdoor rink located on the Civic Center Plaza between The Hemmens Cultural Center and City Hall, will also be bustling with skaters. Skate rental costs $4, with a valid ID. The skating rink is refrigerated, allowing it to stay open regularly through February. As Window Wonderland comes to a close, the City of Elgin officially welcomes the holiday season in the evening, with the annual Tree Lighting Ceremony at 5 p.m. Mayor David Kaptain, city council members and Santa Claus will turn on the holiday tree lights. For more information on other events taking place in Elgin this season, visit ElginHomeForTheHolidays.com. For the past several years, the Aurora Festival of Lights has been one of the largest outdoor holiday light displays in northern Illinois. The Festival of Lights is a free, must-see event in Aurora, with dozens of lighted displays set along a mile-long stretch of Phillips Park, 615 S. Smith Blvd. The displays are both static and animated, and they’re illuminated by thousands of LED lights. This year’s event runs from Nov. 28 through Dec. 28, and is open daily, Sunday to Thursday from 5 to 9 p.m., and Friday and Saturday from 5 to 10 p.m. The festival is sponsored and organized by the Aurora Rotary Club in partnership with the City of Aurora. The idea came from a group of people who were new to the Rotary at the time. Among the popular displays every year are Santa’s Toy Factory, Old Man Winter, elves and reindeer, holiday trains, gigantic snowflakes, lighted holiday trees and other seasonal favorites. Volunteers move displays around and add new ones to keep the event fresh. Although there’s no cost to drive through the display, a goodwill offering is accepted. Since its inception in 2007, the Festival of Lights has contributed proceeds to more than 45 organizations, including those that serve the homeless, youth, seniors, domestic shelters, and the physically and developmentally challenged. Three years ago, the Aurora Rotary Club teamed up with nearby Sheridan Correctional Center, where inmates build 100 snowflake displays and 100 Christmas tree displays exclusively for the Festival of Lights. “It’s a win-win for everyone involved,” says Dougherty. Last year’s festival set an attendance record when almost 20,000 cars passed through the four-week event. The Rotary has likewise impacted the community. A magical light show that brings out the beauty of the trees at the Morton Arboretum returns for a second year. Located on 1,700 acres in Lisle, the Morton Arboretum includes an interactive children’s garden, a one-acre maze garden, specialty gardens and 16 miles of trails. More than 88,000 visitors turned out for the inaugural Illumination event last year, including many first-time visitors to the arboretum. Dorgan expects that number to increase significantly this holiday season, because Illumination isn’t your typical holiday light show. New this year is Symphony Woods, an enchanting light display that’s synchronized to seasonal music from the Chicago Symphony Orchestra. “It will be the most powerful ‘wow’ of the show this year,” Dorgan says. Another new element to Illumination is Meadow Lake Magic, which is centrally located near the walking trail. Meadow Lake will be transformed thanks to 27 custom-made orbs floating on the water. “It will be quite a sight for those walking the trail, as well as folks dining inside our visitors center,” Dorgan says. The popular Tinsel Colonnade, a cascade of multi-colored strings of LED lights that hang from the trees like tinsel, will be doubled in size this year. “It’s truly magical,” Dorgan says. Along the trail, guests can warm up at one of the toasty fire pits or stop at the warming tent to grab a snack and a beverage. Warm meals and drinks are served inside the visitors center. Guests can expect more kid-friendly features, including interactive stations and a scavenger hunt to find the “Glow Man,” a three-dimensional figure hidden along the Illumination path. Every weekend, local bands will perform as part of the festivities. Illumination is open to the public through Jan. 3. The event is open each night from 5 p.m. to 9:30 p.m., with the latest entry at 8:30 p.m.
Tickets range in price for members and non-members, and are available at the Arboretum’s Visitor Services desk, online at MortonArb.org, or by calling (630) 719-2066. This entry was posted on Wednesday, November 26th, 2014 at 11:57 am	and is filed under Features, Top Posts. You can follow any responses to this entry through the RSS 2.0 feed. Both comments and pings are currently closed.